That 22 slot knife block represents a big cheque that I wrote for myself, it’s a Wusthof 22-Slot Storage Block , and it was a birthday present for my brother about three years ago. If you have ever had the opportunity to work with good knives, you will know how awesome they are compared to cheap ones. Unfortunately, cheap ones are cheap and good ones are really, really not! Good quality knives Theoretically, pretty much anyone can get by with just 3 knives, a paring knife , a chef’s knife and a bread knife . However, more is so much better! Good knives are something that most people use and can make a good gift for guys, as well. Like a few other gifts, where there is ample room to continue to give someone more of the same, starting a knife collection for someone gives you many choices over many years. We received our very first good knives from my Mother in Law, after we had moved most of the way across the country. 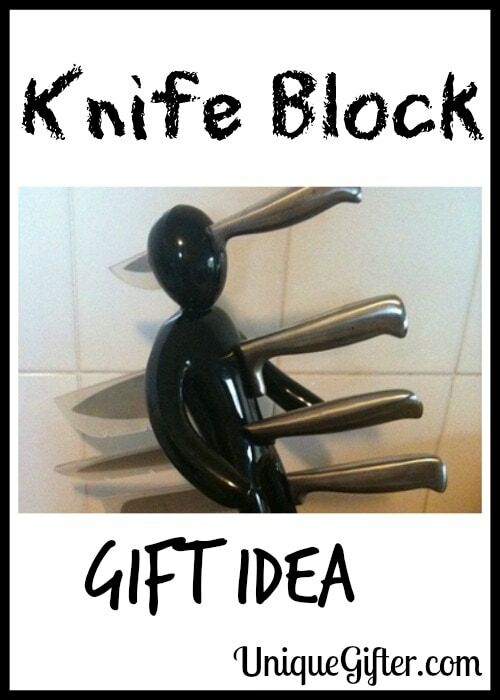 Knives pack well so they can be a gift for someone far away, while still being a rather high value item. Since she bought us the first two, we have added to our collection by giving each other even more, including the knife block. The first knife block gift was from my spouse to me, so really I can’t take credit for any part of this gift idea whatsoever! 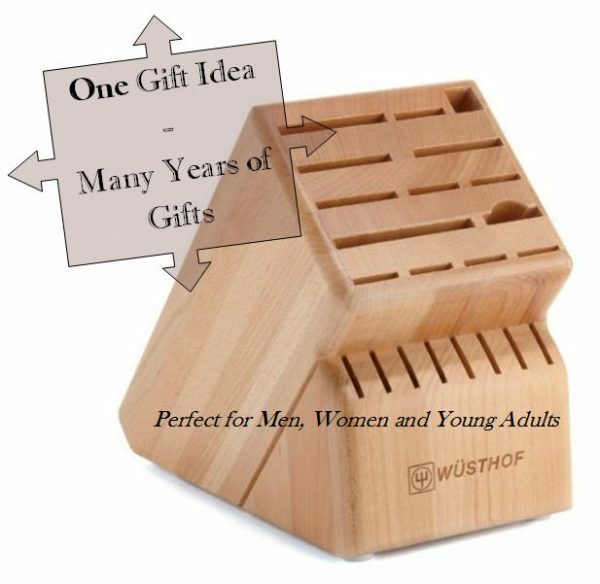 This gift is good for someone who you plan to spend $75-$150 (or more) on for gift giving occasions, over the span of several years. 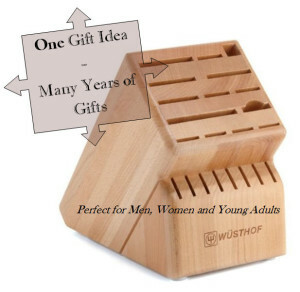 That may mean it is a good gift for your husband, wife, parents, grown children, BFF, brother, sister, etc! It works especially well for young adults, who likely do not have a whole home full of fancy things yet. Most people are rocking their thrift store finds and their hand-me-downs from when they moved to university. The other great thing about knives is that virtually everyone uses them. I mean, there were the few odd kids I knew in university who didn’t cook at all and had outrageous food budgets as a result, but everyone else uses knives. We can judge their life skills later. First off, you want to establish need. Keep in mind that a 22 year old guy may not be thrilled about receiving knives, but 26 year old him will be stoked that he did. I recommend starting off with a key knife, such as a chef’s knife or a paring knife. I recommend keeping track of which ones you have given, in a Google Doc, for example. After the first few, you may want to ask which ones your recipient would like next. After the first two or three is a good opportunity to purchase a matching block. Continue giving knives, until you run out of slots, go broke, or the person feels they have enough! If you have lots of cash up front, you could consider purchasing a large set and then doling them out over time. A good, full set will run slightly north of $1000. Here is a list of knife types that you can use for your gifts, in a rough order of need, for most people. Knife Block – decide how many knives you think they ought to have in the end… and be careful you don’t write yourself a cheque you can’t cash! You can also get multiple sizes of many of these knives, so pick and choose as you see fit! Do you have good knives? I love ours! That's a pretty cool idea. I like the idea of a drawn out present, it keeps the theme going year after year!